Par Excellence Wellness Day Spa offers Skin Care, Massage, Nail Care, Physician's Acupuncture, Reflexology, Spa Treatments, Electrolysis and Beauty Services. Our spa is located in a charming Victorian House in downtown historic Havre de Grace - Harford County, Maryland. 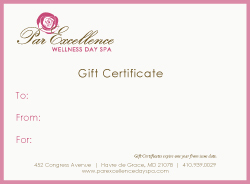 We are pleased to offer Par Excellence Wellness Day Spa gift certificates for your purchase. To order a Gift Certificate or call us at 410.939.0029. You can print out the below printable certificate and fill in your gift info. Gift Certificates expire one year from issue date.